White non-Hispanic population is older at 42.9 years, while Hispanics are 30.5 years. 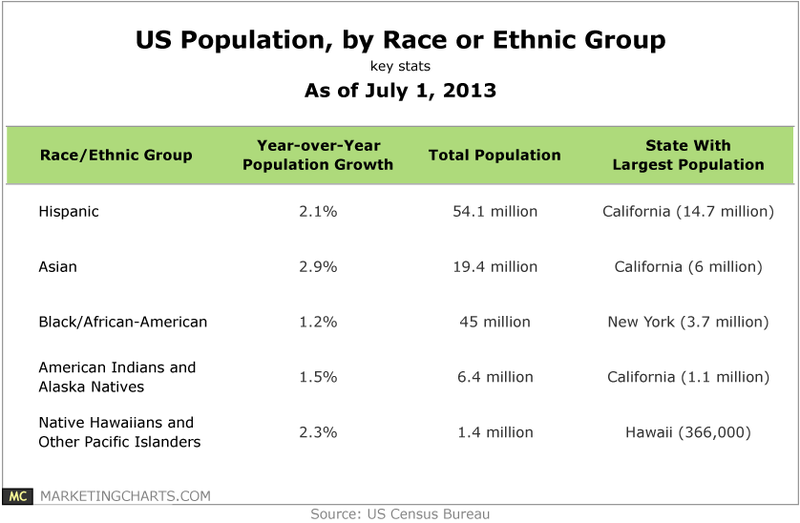 Much as with last year, the primary drivers of population growth for Hispanics and Asians differed. More than three-quarters of Hispanics’ population growth was the result of natural increase (births minus deaths), while 61% of Asian population growth was due to international migration. The Native Hawaiian and Other Pacific Islanders population grew by 2.3% to slightly more than 1.4 million. As a result of those figures, the US’ minority population climbed to 118.3 million people, accounting for 37.4% of the total population. The non-Hispanic white-alone population was the only to have more deaths than births between 2012 and 2013. That population is much older than the minority population; the median age of the minority population was 30.5 years, while it was 42.9 years for the non-Hispanic white-along population. California housed the most Hispanics of any state as of July 1, 2013, at 14.7 million. It also had the largest Asian population, at 6.1 million. New York had the largest black or African-American population, at 3.7 million.